Their tantalising ambiguity is exemplified by their geography. I have done a few posts, eg here, discussing the evidence for a southern Mesopotamian Eden, and for a flood narrative describing the memory of the Shuruppak flood event of c2900BCE. And there are some good clues to follow there. Yet there are difficulties with that view. And there is also a case to be made for setting most of the events of those chapters in the upper Tigris and Euphrates, though that too is not without its problems. There are, for example, good candidates in Eastern Anatolia for the four rivers of Eden that match the description of the river being divided into four “heads”, understood as tributaries rather than tributaries as the southern theory demands. The Tigris and Euphrates rise close to each other, and another nearby river flows north to the Black Sea through a land of historically good gold deposits. Yet, as I said in the post linked above, rivers seldom split into major branches watering disparate lands – and the Tigris and Euphrates even have competing watersheds. And yet, a glance at the literature shows that their upper courses, and not just their lower meanders, have altered greatly within historic times, and particularly as the climate changed after the ice age. I’m not sure that the extent of glacial cover in the Younger Dryas has been fully mapped, and ice-sheets do funny things to the course of rivers. That period overlaps with the dawn of agriculture, and therefore the possible cultural setting for Adam. There are other clues in support of the north-western situation too, firstly in that the general movement of the text is from Eden to increasing ruin, involving progress towards the East: The cherubim guard the garden on that side, Cain is banished to the East, and migration east leads to the founding of Babel and its tower, where the story culminates. That directionality parallels the exile of both Israel and Judah to the east, the latter ending in Babylon, as described in some recent posts. Incidentally, there is a plausible match, suggested by Richard Middleton in The Liberating Image, between the “world’s first empire”, that of the Semitic Sargon the Great, and the events of the Babel narrative, pointing forward, of course, to Nebuchadnezzar’s Neobabylonian Empire. At the very least, the migration of Akkadian-speaking Semitic peoples from the mountains to Sumer is a close match to the men of Genesis finding a plain in Shinar as they moved east. Then again, it is not impossible for the high plateaus to be the situation for the flood. The plateau of Şanlıurfa province, in Southern Turkey, is prone at least to flash floods. 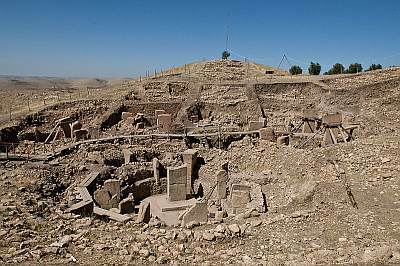 It is the site of Abraham’s town of Haran (the move west from Ur towards Canaan being a parallel with the Jewish return from exile), and also of the earliest temple sites in the world, notably Göbekli Tepe, as well as (possibly) the earliest city Çatalhöyük. Furthermore it is bounded on the north by the mountains of ancient Urartu, where the ark grounded – somewhat more plausible than if it started in the environs of lower Mesopotamia near Shuruppak. Scholars have also pointed out that, at the likely date of the flood, the olive leaves that the dove brought back did not grow in lower Mesopotamia, nor the vines that Noah planted. However they did grow in Anatolia, where not only viticulture, but agriculture and herding, and the metalwork attributed to Tubal-cain, have left their earliest evidence. There – I’ve persuaded myself of the northern case, at least until I revisit the evidence on the southern alternative! But south or north, one thing that is of significance is the unusual interest shown by Genesis in the apparently obsessive desire of Noah’s sons to spread over the earth, documented in the unique “table of nations” of Genesis 10. In my university days, a linguistics lecturer made a mockery of that when he laughingly began the course by saying all modern languages stem from Babel. And yet since then the genetic evidence has shown beyond reasonable doubt that the Neolithic Revolution spread across the whole of Europe not just by diffusion of ideas, but by a mass migration of people from Anatolia. That, it seems, is how Cheddar Man’s descendants ended up white, as well as blue-eyed. But I want you to notice something about that map of the Noahic nations. Though it is necessarily somewhat approximate, there is a decided bias towards the territory west and south of the Caspian Sea. “Semitic” (in the anthropological sense) spread largely ceases at the mouth of the Euphrates and the Arabian peninsula. Now check out a couple of articles, or the graphics attached thereto. First, this one. It shows known Neolithic sites in Western Asia. Ignore the colours, which represent only dating methods, but note that there are two distinct foci, as if agriculture arose independently both in the ANE, and much further east, around the Indus valley. Now have a look at this article, and particularly click on figure 4 down the page, which looks at human DNA patterns present both in Europe, and south-east to Anatolia and the Levant; and from Iran eastwards to India. Both reflect migrations of Neolithic farmers, but the genetics seems to confirm the archaeological evidence of two quite separate centres of origin. What is fascinating is how the Genesis table of nations tends to match the archaeological and genetic story of the spread of the western Neolithic civilisation, even down to not claiming to have peopled the east. Now the dates don’t tie up well for flood dated at 2,900BCE, but that’s a detail. 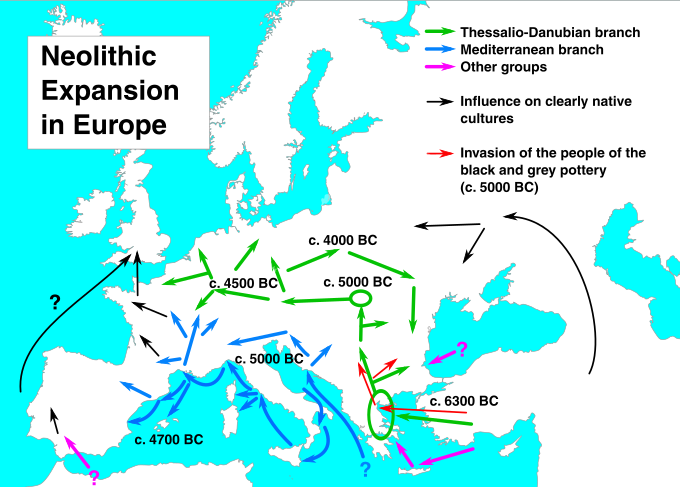 Think about this, though – at every point in both the Neolithic migration, and in any Noahic radiation known to the writer of Genesis, the emigrants would have encountered the existing Mesolithic peoples they displaced, or absorbed, or however it was. And news of those encounters would spread back to the centre of the radiation. If the Genesis writer had knowledge of where Semitic settlers had ended up, as he did for the table of nations, he also knew there were other, pre-existing, peoples in those lands. It was well known to the Mesopotamians, and also well-documented, that the Sumerians had experienced an influx of Akkadian-speakers from the upper Tigris and Euphrates – the same influx I have pointed to in the Babel narrative. So this mixing of populations must also have been known to the writer of Genesis 10, whenever it was written. The fact that it is not mentioned, just as other people living at the time of Adam are not mentioned, is therefore likely to be because Genesis 2-11 is about Adam’s offspring, not because only Adam had offspring. I hasten to add that Genealogical Adam would still have been diffusing his family tree eastward despite this genetic evidence (check out another strand of DNA that fills in another part of the story). But when one considers that the European migration was a rare and important event that has determined our genetic makeup even up to now (I speak as an Englishman, you understand); and also that the table of nations is a unique document in a book that is important for separate reasons, but arising in the same people group – and you have an interesting historical phenomenon, rather than a vague myth. Well I am encouraged by your post. When people speak of the first eleven chapters of Genesis I might normally implore them to “read my book on them” but you seem to be getting to the same place without it. I do argue for a flood date of 4500 BC- just where it would be if you took the genealogies at their word reading them the “long way” and Dr. Bryant G. Wood’s early date for the Exodus. When you look at it like that, the sudden end of the Uruk expansion in 3100 B.C., matches up very well with the Babel account. What actually happened was that people left off building cities and scattered to the hills. The J-Rich Y-haplogroup expansion of culture which then occurred…..
…did not have a corresponding language dominance (unlike the R-rich expansion to the north). This event even lines up with the “days of Peleg” in the genealogies (in his days “the land was divided”). I consider that the table of nations was composed over time after the Babel account though still completed by Moses. The Babel account described what scattered the families of Noah, the Table describes where they went after the scattering. BC is the historic and accurate way to date. NOT BCE which is av left wing aggression without the consent of the people. The table of nations/peoples is unique in ancient history. no one else tried or did this. Its not based on highlighting the jews. in fact they are only families off bigger groups. something no one else would be humble about. its not Hebrews of coarse but Gods word. The japhetic list works excellent with indo european. As language would diverge in a logical way from babel. Even if folks deny genesis as from god they still must agree its the opinion of scholars writing in those days. so it has at least historical importance. In every way it works. for example the origin of englishmen. i’m confident GOMER is the firs GERMAN9why not the likeness of the word) and his son Togarmah is eastern Germans God THOR. They remembered Torgamah because he lived hundreds of years as a leader. So from Togarmah came the eastermn germans and so Englishman. its very unlikely the biblical scholars were lying about this table of nations. its the actual description of mankinds divisions which god thought we had a right to know. otherwise we would accuse him of leaving us in ignorance. Robert, I have to say that if the table of nations was given to make the origin of today’s nations clear, it’s not apparent why it would require sheer speculation based on mere verbal similarity, such as you give. It was the Romans who called various tribes “Germanici” – my dictionary suggests that the actual etymology is from the word the Celts applied to them, “Gair”, meaning “neighbour”. It sounds to me more like British Israelitism than an understanding of Genesis. Heard of the concept of British Israelitism but quite vague about it. not my thing. The list was made, by gods word, to include the great divisions of man and god knew the future. so why wouldn’t the great German family be in the list? You suggest it was the romans and then the celts. Well why not another option. The romans just repeated what they heard. the celts just repeated the word and it came to mean neighbour. Gomer really does seem to be german. Torgamah to be THOR. then prophecy hints about Torgamah in the future as i sad. i think it is likely true. i think tiras(thrace) is most likely, commentators said this in the past, the Celts. As per the command from God, but here is my question: When did the son’s of Noah spread across? Im asking because in the Babel story they are NOT spread and instead God has to interfere and do the spreading for them. How does this all fit together per the text? Sorry for slow reply, Mark (and others) – the website notified me of comments late, so they disappeared in my Inbox! On the flood date, it occurs to me that if the Flood were a highland Anatolian one, it could be reflected in any of the lower Mesopotamian flood levels, of which the largest is Ur, around the right time. The fact that it appears localised in the deposits would be immaterial: the sediment would come from the hills wherever it ended up on the plain. Answering Hanan (and referring to your point) I’m not convinced that we need to take the Babel account as preceding the diaspora of Noah’s sons. Perhaps the accounts are chronologically ordered. In the table of nations, the spread appears natural, not traumatic, and the diversification of language is also included as a matter of course. From which I suspect that the Babel narrative is talking only about the language of the men who moved East to Shinar – if indeed we don’t take account of the other interpretations that suggest “one lip” is sufficiently unusual to mean something other than languages. Adapting Richard Middleton’s understanding, the “non-scattering” of the Babel folk would be to do with the consolidation and imposition of uniformity of Empire building. In any case, to step outside the Bible narrative for a moment, I think we do have evidence for scattering from Anatolia – but I don’t think we have it for a spread across the world from southern Mesopotamia. But aren’t the “men who moved east to Shinar” the very same clans of Noah by which “the land was divided” in the table of nations? Doesn’t it say they wanted to stay in one place and not be scattered across the whole land? Surely this implies they had not already scattered per the table. It depends what you think the Babel story is intending to say. On one strict understanding of the table, it was Nimrod and his particular branch of Ham that began his kingdom in Shinar, and no others. Which corresponds well to “men moving east and finding a plain in Shinar” in the next chapter. 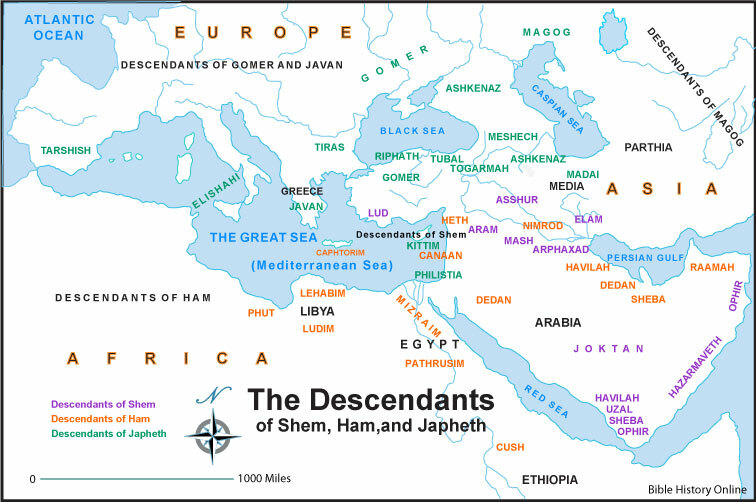 At least 3 other sons of Ham, and all the offspring of Shem and Japheth are described as spreading out to their various places, and there’s no hint in ch 10 that they were all associated with Nimrod. The question would then be why Genesis 11 would focus on this one clan gathered at Babel and afraid of scattering. Middleton’s suggestion that it’s a critique of their particular invention of restrictive imperialism makes sense in that context – rather than a (historically implausible) poition that the entire Noahic race travelled east to one cityen masse and refused to budge any further. The interpretation of “whole earth/land” and “one lip” obviously comes into play here. On your other point, one thing a “highland” flood does is to make a link with lower Mesopotamian flood deposits looser. The Shuruppak flood has good literary links with the Babylonian flood tales – but is local. The Ur deposits are very thick, but even more local. That may be because that’s where the floods were localised, or more likely because deposits are deeply buried elsewhere, or because they’ve been eroded – the historical hydrology is very complex indeed. It follows, given the annual inundation, that there might have been any number of significant floods for which there is currently no evidence – knowing the propensity for flooding, paucity of evidence shouldn’t force us to pick one we happen to have dug up. Noah’s flood doesn’t even have to be the biggest – just the one that took out the region where the descendants of Adam were living. And our knowledge of the place and time that occurred is on any model going to be approximate and provisional. So varves in Lake Van may help, or may not! The main point, to me, is that there are so many correlations between geography and history gleaned from various sources that a basically historical narrative becomes more plausible than a myth made up by some exilic figure inventing a prequel to the recent history of Israel. A typo in your blog probably worth correcting “century” for “millennium”. Of the main point all good observations: it underlines that the text (like not only all texts, but all contingent knowledge) is underdetermined. We can hope to edge closer to the truth, and to exclude more and more wrong understandings. Your gut is right. The table of nations is where they wound up AFTER the scattering, and the scattering occurred at Babel. It is added on like an afterthought to whoever compiled the tablet that I presume Moses was working off of, but it is pretty important. For one thing the text reads like when the clans of Noah found the plain in Shinar after the flood there were already other people there. https://youtu.be/IdU034rS3ZM The flood account is about the line of Adam the man getting purged, not all of the race Adam being drowned. Despite that, if Adam’s line had been extinguished the the line of Messiah would by cut-off, resulting in the eventual perishing of the whole earth. My studies have convinced me that there was an early expansion radiating out from the Armenian highlands area which was the home ground of Adam after Eden. The first radiation was tied to the expansion of farming and was a result of Adam’s daughters being married off to surrounding tribes (the Sons of God other than those who called themselves by the name of the LORD) and taking their knowledge with them. The second radiation from that area was a result of the sons of Noah accumulating large households of natives as they scattered from Babel and these becoming the core of nations. This is depicted in the J-rich group in the picture from a human anthropology forum. https://youtu.be/IdU034rS3ZM The black oval in that picture is basically a graphical display of the table of nations! They don’t mean for it to be. I pulled the pic from a secular anthropology forum. But it lines up to a “T” with what is in Genesis chapter ten. The time frame for this is around 3100 B.C. There was another expansion of R’s to the north, and that may have been mediated by the daughters of Adam marrying off into those clans to, just like the earlier expansion. If the table of nations is after Babel, who is is all nicely split between Noah’s three sons? You would think if Babel came before, then all of Noah’s descendents would have been blended together and there would be no way for them to be dispersed based on such accurate ancestry. Well the dialogue here as prompted me to go back and look at the text and modify my view on it some. Really it is better to say chapter ten describes a long period of time which started before Babel but extended after it as well. For example the clans of Japheth are listed before Nimrod and Babel are mentioned.